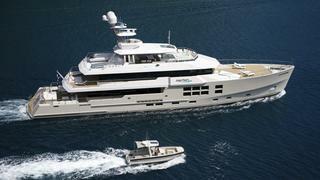 Hot news that the 45m expedition Big Fish is sold with Y.CO acting for buyer and seller. In addition to the master stateroom, two full beam VIP cabins can split into four en-suite queen cabins to accommodate 10 guests comfortably. Big Fish received a Judges’ Special Commendation at the 2011 World Superyacht Awards and was asking $25 million She will continue to be available for charter with Y.CO.